No need to pack your bags, Pragmatic Play is bringing Vegas to you with this live casino themed online and mobile game, Joker’s Jewels slot. This 5-reel casino slot has 5 pay lines and a return to player of 96.50%. Join the fun and see if you can get your hands on some of the Joker’s Jewels. This Easy Slots game is full of jaunty fun and carnival style audio and takes us to the casino floor. 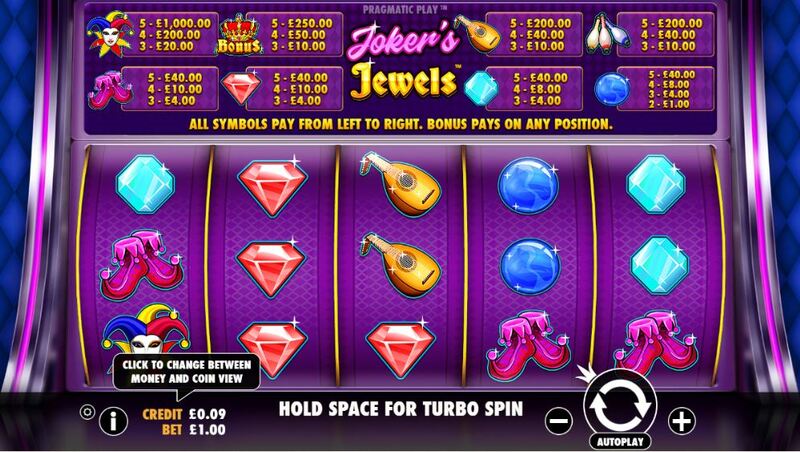 The reels are exactly like a real slot machine and feature attractive images and vibrant graphics. The reels are set to the outline of the casino machine and there are deep blues and purples creating a soothing and relaxed tone as you enjoy spinning and imagine you are in the Bellagio. The images and symbols on the reels are crisp and bright, including the joker himself, a mandolin, a crystal ball, joker’s shoes, a bonus crown and those all-important shining jewels. The symbols flash along the top reminding us just how much we could stand to win. If you can’t wait to get your hands on some of those Joker's Jewels, head to easyslots.com now and play for real cash prizes. Pragmatic Play are one of the fresh faces in the online slot gaming industry, having launched in just 2015 but they have already created some alluring and entertaining slot games. This Malta based company are working hard to spread their influence and provide top class gaming to players worldwide. If you loved to play Joker’s Jewels, check out some other Pragmatic Play titles such as 3 Kingdoms: Battle of the Red Cliffs, 7 Piggies or 8 Dragons on Easy Slots now! There is one bonus available in this game and it comes in the form of a bonus crown. All wins which involve the bonus crown will be multiplied but the total bet and 5 of these coins will pay out 62.50 coins. The highest paying symbol on the board and one to keep an eye out for if you really hope to win big is the joker. 5 of these on the reels will award the player with a generous 250 coins. The mandolin and bowling pins are two more high payers worth keeping an eye on.